Murder on the Road to Hana? I know that title sounds like a 48 Hour Mystery headline, and it just might be one day, but it’s the lead in to this week’s blog subject. Two weeks ago Linda and I were on the island of Maui with three other couples, mostly to play golf, drink pina coladas and watch sunsets – I figured I needed a break from my hectic retirement schedule! 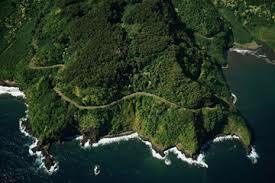 To add a little adventure to my relaxation, I decided to rent a Jeep and ‘do’ the road to Hana. I had attempted this once before about 20 years ago with Linda and three small children in tow, but after a dizzying ride through 25 miles of multiple twists and turns with Linda and the kids tuning green, we reached a shave ice stand with a sign that read, ‘Halfway to Hana’, “Halfway! !”, came the cries from the back seat. I got out to get some shave ice in hopes of buoying the troop’s spirits, but by the time I got back, the Jeep had been commandeered and was facing the other way – the message was clear. When I told our group this year that I was going to finish that journey and asked for any passengers, I heard crickets. I was not going to just do the road to Hana, I had planned to do a complete circumnavigation of the southern part of the island and ignore any signs past Hana that said, ‘Dead End’ or ‘No Rental Cars Beyond This Point’, so it was just as well that I had no volunteers to accompany me on my illicit and operose odyssey. I set out at 7:00 a.m. and I have to admit, the road does have a few turns in it – 617 so I am told, and although driving doesn’t allow you to observe much scenery, there are plenty of places to pull over and enjoy the water falls, hiking trails, lava caves and spectacular shoreline – which I did. Because of the early hour, there was very little traffic on the road, although surprisingly, I did pull over twice to allow police cars to go around me. When I stopped to observe the beautiful Keanae Peninsula I saw what I thought was a sightseeing helicopter, but tuned out to be a police helicopter. I wondered what was going on. I briefly wondered if Linda had called and asked them to keep an eye on me. I didn’t think much more about it until I was about 6 miles from Hana when I came upon a young lady standing on the narrow roadside, flagging me down. I would normally not pick up a hitchhiker, especially in a strange place, but she seemed to be a damsel in distress, I had room and I was on an adventure, so I stopped. She jumped in and said “Thanks”. I asked her where she was headed. She looked at me as if I was from a village that was missing its idiot and said, “Hana?” It hit me that there really was no other place to be going. Feeling stupid, I wanted to show her that she was dealing with someone who could ask astute, insightful questions, so I continued with, “What’s your name?” I knew I didn’t know the answer to that one. “Kristen”, she replied and I think she felt bad about her first response so she felt obliged to tell me ‘her story’. 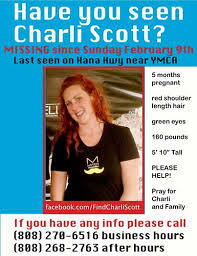 She had just been out with her boyfriend and a couple of other guys, who were wild pig hunters, to search for a friend, Carly Scott, who had been missing for three days (At this writing she is still missing after nearly a month). I asked her why she left the search party. She said these pig hunters really knew the terrain well and she was afraid they were going to find Carly and it wouldn’t be a pretty sight. So she decided to leave the group and head back to town. I asked about the circumstances around Carly’s disappearance and she told me that Carly was 5-months pregnant and was last seen with her ex-boyfriend, Steven Capobianco, the night before she disappeared. She went on to tell me that Carly’s car had been found torched and left in a ravine, parts of her clothing were also found along with her dog, Narla – Kristen said that Carly never went anywhere without her dog. I asked Kristen if the boyfriend was a ‘person of interest’ and she indicated that she and her friends concluded that morning prior to setting out on the search that they thought he was the primary suspect. It was believed that she was carrying his child, he was the last one to see her under strange circumstances the night before her disappearance, and he failed a lie detector test given by the police. That’s why I’ve used the word ‘Murder’ in the headline; I don’t pretend to be judge, jury and executioner, but it’s hard to go missing for a month on an island as small as Maui. I check the Internet everyday for up-dates, but nothing new for the last two weeks. You can Google ‘Missing Woman on the Road to Hana’ to see new info as it becomes available. 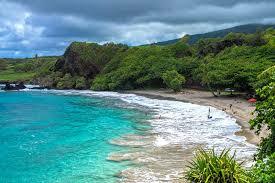 Next time: I’ll conclude my journey ‘On the Road Passed Hana’ which includes the beautiful Koki and Hamoa Beaches. Do you read our blog but don’t subscribe? Subscribe, it will make us feel better; and if we feel better perhaps we will write better . . . it could happen. Heartbreaking! So hope she is found! You looked quite calm last time I saw you. Who will portray you in the role of “friendly old guy driving along” in the Dateline summary? They’re looking at getting Charlie Manson out of prison to play my part! Thanks for the comment. WOW BOB SPARROW…that is quite a sad story!! I hope they find her…alive! Tim and I used to stay at the cottages on the beach at Mama’s Fish House in Paia every year and we did the whole “road to Hana”….. ONCE!!! 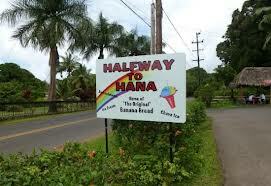 As you know, Paia is right at the beginning of “the road”…it was an ALL DAY journey…. and quite an adventure…that back side is desolate!!!! We didn’t come upon a single human after we left Hana….scary…we were also in an open Jeep….makes for a bumpy ride to say the least!!! It was good to get back on solid ground. Of course, we stopped at the winery on our way back…..quite interesting!! Anyway….can’t wait to read about the rest of your adventure!! Thanks again for some good reading!! Will do – thank you Pam for your interest.